Established in 2000, the residency program is a 12-month didactic and clinical training program for licensed, board-certified PAs who wish to specialize in cardiothoracic surgery. It expands upon the basic training of the PA in diagnosis and management of conditions common to cardiothoracic patients. The PA resident participates in all phases of care of the cardiothoracic surgical patient including assisting in the operating room. The program is designed to provide the graduate physician assistant with opportunity to obtain advanced training in cardiothoracic surgery. St. Joseph Mercy Hospital is a 581-bed, award-winning academic teaching hospital and tertiary care center providing specialized care not typically available at community hospitals. Located near Ann Arbor, Michigan, it is one of several large teaching institutions in the suburban Detroit area, participating in the education of PA students, medical students and physician residents. SJMH-AA is a premiere center for cardiac surgery, having been designated as a 3-star program based on STS outcomes in 2014 (top decile for the country), as well as a Truven Health Analytics Top 50 Cardiovascular Hospital in 2015. The SICU admits approximately 700 postoperative cardiac and thoracic surgery patients each year, with a range of surgeries including coronary artery bypass (conventional and off-pump robotic revascularizations); ascending/descending aortic replacement; complex valve repair & replacement (including the Ross Procedure and robotic mitral valve repair); and complex thoracic procedures (such as esophagectomy, minimally invasive pulmonary resections, robotic excision of mediastinal masses, and advanced airway management). The high acuity and fast pace of the SICU provides current residents with a rich learning environment. Intense training in patient management, procedural skills, and service leadership skills, will be abundant. The resident will also develop administrative skills as they will attend service delivery committee and educational meetings. The program utilizes all forms of learning, ranging from textbooks, self-driven internet based didactic modules, critical care medicine webinars, monthly journal club, M&M conferences, resident quality improvement projects, and simulation-based training for procedural and code skills, including emergent bedside resternotomy for postoperative arrest in the postop cardiac surgery patient population. These innovative approaches to cardiothoracic surgery education, coupled with the advanced proficiency of the SJMH cardiothoracic surgery service will provide an excellent foundation for PAs interested in excelling in cardiothoracic critical care management. Upon completion, the PA will have an in-depth understanding of the various subspecialties within cardiothoracic surgery, including: Coronary Artery Disease, Aortic Valve Disease, Mitral Valve Disease, Aortic Aneurysm, Congenital Heart Disease in Adults, Esophageal Disease and Carcinoma, and Lung Carcinoma. The graduate will have had extensive experience in the triage, evaluation, treatment and management of cardiothoracic problems in each of these areas. The graduate will have developed into an independent first-assistant in the operating room. We have 1 surgical residency position per 12 month period. The didactic and clinical portions of the program are integrated. The residents attend 3-5 hours per week of didactic sessions, including lectures, conferences and grand rounds. Clinical training includes intensive care unit orientation and rotation, daily patient rounds in the ICU and step-down units, training in invasive procedures, surgical skills lab, and progressive levels of involvement in cardiac and thoracic surgical cases. Various techniques of conduit harvest (open and endoscopic saphenous vein harvest, radial artery and arm vein harvest) will be mastered. Additional skills include cannulation and repair of femoral vessels and placement of chest tubes, invasive monitoring lines and intra-aortic balloon pumps. The goal is to advance all residents to the level of independent first assistant in the operating room. Residents will experience call duty with service PAs for surgical emergencies and weekend rounds with attending staff. Applicants must be graduates of an ARC-PA accredited physician assistant program and be eligible for (or have passed) the NCCPA board exam. Residents must obtain a Michigan License upon acceptance into the program and undergo a pre-employment background check. Current ACLS certification is required. Upon successful completion of the residency program, the PA resident is awarded a certificate of training signed by the Chairman of the Department of Surgery, the Head of Cardiac & Thoracic Surgery, and the program directors. The SJMH PA Residency in Cardiothoracic Surgery is approved for the maximum CME credit (50 hours) by the American Academy of Physician Assistants. Family Health Insurance, Malpractice Insurance. Ten days paid vacation. The resident will also be provided with surgical loupes, lab coats and reference materials. Arranged individually by each resident. The Medical Center is located in a suburban residential area with many apartment complexes nearby. 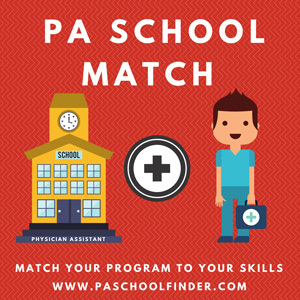 The Physician Assistant (PA) Program at Marywood University is committed to providing students with an exceptional education in a supportive and nurturing environment. The Riverside County Regional Medical Center/Riverside Community College District (RCRMC/RCCD) Physician Assistant (PA) Program is dedicated to primary care physician assistant education; is committed to diversity in the selection of students, faculty and curriculum; emphasizes service to the medically underserved urban and rural populations of Riverside County; promotes the PA profession; and strives to produce quality primary care providers.